Welcome to Mary Judge Designs, specializing in innovative design. We create products that are contemporary in design, inspired by the Mediterranean lifestyle. 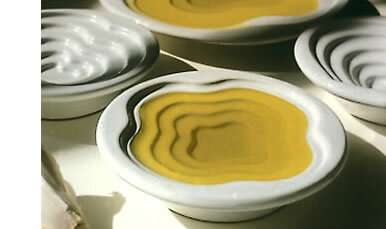 Our best known design is the terraced olive oil dipping dish, or "pinzimonio" featured here. You may have seen it featured in In Style, New York Magazine, Wine Spectator, Gourmet, Elle Décor, Oprah, and many more. As of September 1st this year 2014 I have licensed my design to HF Coors, who has manufactured our high quality olive oil dipping dish since 2013. HF Coors has produced ceramics for nearly 90 years, and proudly carries on the early crafting traditions, creating durable dinnerware for restaurants, hotels, resorts, as well as the home. Our olive oil dipping dish is lead free and made 100% in Tucson AZ. Founded by Herman Coors, a member of the Coors brewing family, their sole interest is in producing superior ceramics. Proud to be made in the USA! I am sure you will enjoy this fine product with your family and friends for years to come.